We're ready to play with paint! If you want to, you can spend a little time with some extra-fine sandpaper to smooth the glue fillets we applied along the fins. Like anything other paint job, prep is 90% of the way to getting a great finish. First step is the primer. Use Krylon or Rustoleum, grey, white, or ruddy brown, whatever you can find as long as it's sandable. You'll need to make a simple tool to hold the rocket while spraying paint. The easiest way is to roll up a sheet of newspaper into a tight cone, and then slip it into the motor mount. You can use a couple strips of masking tape to hold it together. Then you hold the 'wand' with one hand while spraying paint with the other. The key to getting a nice finish using spray paint is to use light coats. By light, I mean you should still be able to see through the paint until after your third coat. The primer dries quickly, so this doesn't take a long time. You want to spray many light coats instead of one or two heavy ones. Once you've got complete coverage (up to 4 or 5 coats), let it dry - read the can, it's usually less than an hour - and then lightly sand the entire rocket with that extra-fine sandpaper. Let the rocket sit and dry for at least 24 hours. It's possible to get near-professional results with this method, but you're going to put in plenty of sandpaper time and effort. If you wanted to, you can repeat the entire priming/sanding process two or more times, running a tack cloth over the surface in between each sanding session. Next comes the color coat. Once again, I tend to stay with Krylon or Rustoleum. Since the Fat Boy has white decals, I'm going to use a dark color so they show up well. If I were going to paint the rocket a lighter color and I'd used a dark gray or brown primer, I'd then spray a couple of light coats of white first, just to lighten up the final finish coats. The same spray techniques apply with the color coat. Spray multiple light coats to prevent runs and drips. Read the can carefully and follow their directions for drying times. Sometimes you have to wait a minimum of time between coats, or put the next coat on within a certain time frame. I suppose I should mention that you should always paint outside. Even if it's cold out, you can go out, spray the coat of paint, and then bring the rocket inside until it's time for the next coat of paint. Once you get the rocket completely painted with the color coat, let it dry. Because of the many coats used (or if you got impatiant, the thick cover coat), the rocket needs to sit for at least 24-48 hours, and longer is better. Now, specifically for this rocket, here's what I did: I used Rustoleum sandable primer, and Krylon gloss white, gloss banner red and gloss regal blue, all in spray cans. Step one was applying four light coats of primer, sanding with 320 grit sandpaper between coats. Then I let it sit for several days. Next up, an all-over coat of blue, applied in 4-5 light coats, followed by one fairly heavy 'finish' coat. I let the rocket sit in the sun for about ten minutes between coats. The nice thing about Krylon is you can recoat anytime. If I were going to be masking this rocket off to paint different colors, then I would have let it sit for several days for the blue paint to fully dry. Instead, I decided to 'fade' the colors together. Starting at the top, I sprayed several coats of white over the blue, making sure I never went as far down as the joint where the nose cone meets the body tube. I concentrated more paint towards the top of the rocket to completely cover the tip of the nose. The nice thing about this 'fade' technique is that you can just do it by eye and stop when it looks good to you. I also did a light fade of white in a band near the top of the fins so that the red and blue would contrast better and to brighten up the red a little. Once that had dried a few minutes, I sprayed the red in the same manner as the white. Concentrate the color more towards the ends of the fins and bottom of the rocket to create the 'fade' into blue. I was careful to not completely cover the white band. 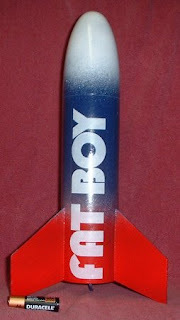 The best tool for painting a rocket like this is a 5/8" dowel about 18" long (or you can use a rolled-up newspaper like described above). Slide it up into the motor mount and you have a wand to hold and manipulate the positioning of the rocket while you spray. Several hours later (I got impatient, you should wait a day or two), I cut out the decal and put it on the side of the rocket. I didn't use the fin decals. I normally don't like the newer self-adhesive kind, but this worked ok. I also thought about cutting out the "FAT BOY" letters to write something like "OY BATF", but it's been done before, so I stuck with the original. So that's it! We now have a completed rocket. If you build and fly your own, I'd love to hear about your experiences and the maiden flight!